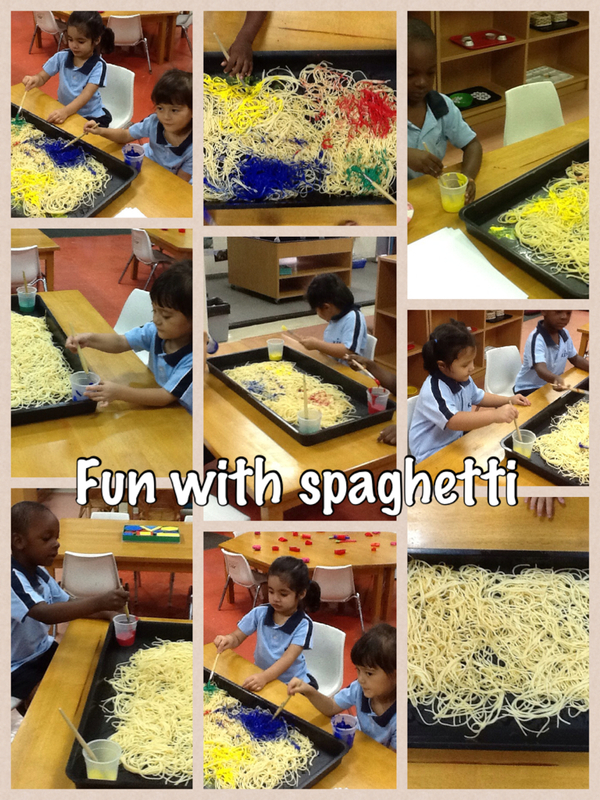 Sensory play involves all 5 senses. Over the past month we’ve made an effort to give children more of a variety of sensory play. It gives the children an opportunity to delight and express their feelings and emotions. We are always amazed at how vocabulary is developed as children are so eager to express themselves. Asking children questions such as “What does it feel like”? “What is happening”? gives children an opportunity to express their thoughts, feelings and emotions. By giving children the opportunity to investigate materials with no preconceived knowledge, you’re helping them develop and refine their cognitive, social and emotional, physical, creative and linguistic skillsets. The most obvious cognitive skills sharpened by sensory play are problem solving and decision making; simply present a child with a problem and various materials with which to find a solution, and you can almost see the connections their brains are making. A few examples from Angie Dorrell include deciding how to build a boat that will float, how to turn whipped cream green, or how to make sand stick together. In addition, children can build math skills such as comparing size (big versus small), counting and one-to-one correspondence (matching numbers to objects), timing (does water or oil move faster? ), matching (same sizes and shapes), and sorting and classifying (buttons, beans or rice), and science skills such as cause and effect (what happens when I add water to sand? ), gravity (water slides down a funnel, not up) and states of matter (ice melts). Without realizing it, children grow into amateur scientists by making predictions and observations, and even develop analysis skills. Children can’t define parts of language until they’ve experienced the true meaning of the word. The attempt to convey something without the proper words to do so can be frustrating for children—and adults! Sensory play encourages children to use descriptive and expressive language, and to find meaning behind essentially meaningless words or gibberish. Take for instance, the word “slimy.” Sure, you can explain what it means with different adjectives, but until you experience something slimy firsthand, that’s all it will be: words. Angie Dorrell adds that children develop prewriting skills as they pour, spoon, grasp and work on eye-hand coordination tasks while using various materials. Fine motor skills are often defined as the coordination of small muscle movements (usually hand-eye coordination) that enable us to perform a variety of important tasks. For children, these tasks might include tying shoes, zipping zippers and even turning the pages of a book. Gross motor skills involve the larger muscles of the body and include activities such as walking, running, pushing, pulling and throwing a ball. Some examples of sensory play benefit the development of fine motor skills by encouraging manipulation of materials, such as mixing, measuring, pouring and scooping, while other examples, such as exploring surfaces, lifting, throwing, rolling and water play, help develop gross motor skills. Even recruiting your child to help you build a sensory table for future explorations is exercising motor skills. “Sensory experiences,” explains Angie Dorrell, “provide open-ended opportunities where the process is more important than the product; how children use materials is much more important than what they make with them.” Prompting your child to think creatively in order to solve problems or engage in make-believe helps them express their creativity and build self-esteem.